Butter Murukku is a popular savory snack, originated from Tamil Nadu. This crispy and scrumptious snack is now a favourite all over the Indian Sub-continent with variations and different combinations. The basic ingredient of this South Indian Delicacy is rice flour, mixed with various combinations like Urad Dal flour, Besan (Gram Flour), chick pea flour etc., and a choice of flavors like Cumin, Asafoetida (Kayam), Ajwain etc., deep fried in oil. Onion Pakoda is another favourite south indian snack. 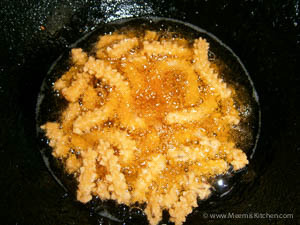 This Butter Murukku is known in different names like chakli, chakri etc. and is quite famous across the globe. There are many varieties of this savoury Butter Murukku and now a days it is a common snack during Diwali. Crispy Butter Murukku is my favourite as it is soft and rich and crunchy on the outside. Usually Murukku is very crunchy and hard but adding butter makes it little tender and easy to chew. I still remember the Butter Murukku made by our friend Venky’s mom when we went to visit her. The taste of that traditional butter Murukku made me an instant fan of Murukku. When I was pregnant with Matthew I had a craving for Crispy Murukku and aunts in the neighborhood, would bring me home made murukku.. Maybe the reason why Matthew loves Murukku so much. 🙂 When we lived in Chennai, my dear friend Deepa would get me packets of Murukku from her hometown and Matthew will happily eat it for lunch and dinner. They used to call him Murukku Mathan!! I can go on and on with these kind of Murukku stories..
Children love all kinds of fried snacks, like chicken cutlets, Uzhunnu Vada, Masala Vada, Crispy Cone, fish fingers, soya cutlets, paneer fingers, Meat rolls, chicken samosas, Spring rolls, squid rings etc. Butter Murukku is wonderful as a quick snack and will stay fresh up to two weeks in airtight container. 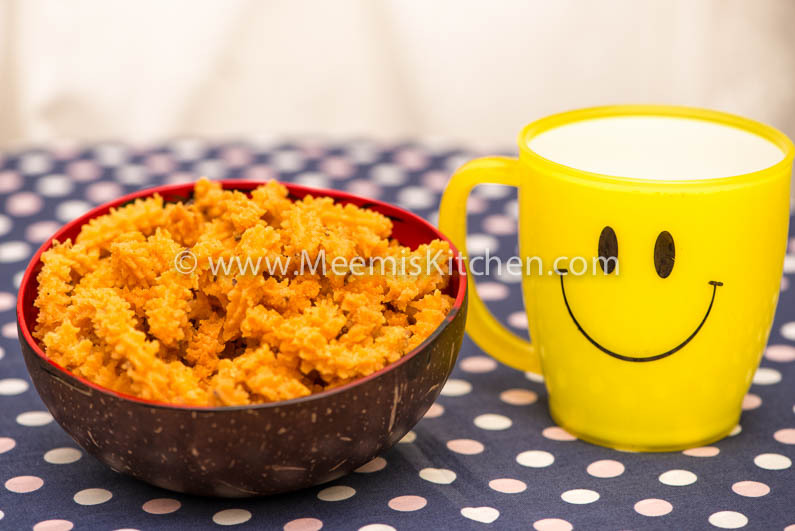 The Crispy and Crunchy Butter Murukku is quite easy to make and a delicious snack for kids. It tastes way better than the packet ones that you get in market. Try this easy Butter Murukku and let me know how you liked it. Enjoy! 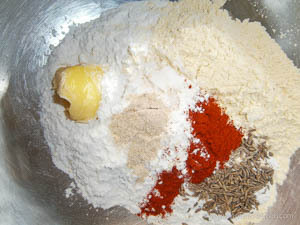 In a bowl, mix the rice powder, Besan (Gram flour/ Kadala Maav), salt, chili powder, cumin (Jeera) and asafoetida (Kayam pdr). Add butter and mix. Now add little water to make a soft, smooth non sticky dough. 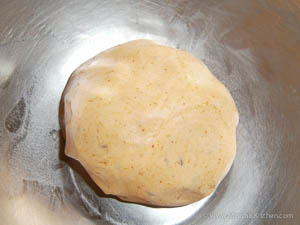 Take the presser, fit in the star plate and fill it with the dough and keep ready. Heat oil in a kadai and when the oil is hot enough (check by putting a pinch of dough, it should sizzle up immediately), hold the presser on top of the kadai and press directly into the hot oil. It will break on its own. Fry to a golden brown, stirring occasionally. Drain them on a kitchen towel. Enjoy the crispy, crunchy Butter Murukku. If there is any Murukku left, store them in an airtight container. Rice flour should be fine powder like in Appam or Idyappam Rice flour. You can make without chili powder also for plain murukku. You can also try adding ajwain seeds. If you are using salted butter add salt accordingly. Please follow the exact measures. If there is too much butter it will make it soggy. Always hold the presser at a comfortable height over the oil so as to avoid hot steam on your fingers. Please don’t overcrowd the kadai. The oil should ideally cover the murukku fully, or it will absorb more oil.Hope you liked this recipe. I would like to hear from you, if you like it. Comments from you would motivate me to bring you more delicious and wonderful homemade recipes. God Bless!! Yes meenami they all liked your butter murukku and mango smoothie which I made for them today…Milan is repeatedly asking whether murukku was made by me.He can’t believe it.Such a crunchy delicious crispy recipie…also mango smoothie very tasty simple delightful recipe.Definitely all kids will love it.Highly recommending to all to try meemis recipes..love you dear. Thank you so much dear. I am so happy to hear your comments. All kids love Murukku and smoothie here as well.